When I was a college student, I attended a seminar that was led by a graduate student as he presented the appeal and the opportunities in his field of study, which was theology. In the course of his presentation, he shared the viewpoint that, in order to become someone able to be used by God for greatness, you need to be characterized by the acronym of F.A.T. : Faithful, Available, and Teachable. I do believe that these characteristics ought to be exhibited by any and every Christian in their relationship with God, but I also think that they ought to reflect our growth in our leadership. Particularly, I believe that becoming teachable is absolutely essential to, and in direct proportion to, our level of growth and our capacity to lead. He was not the only person to share that sentiment. Abraham Lincoln, the 16th President of the United States, once said, “I don’t think much of a man who is not wiser today than he was yesterday.” Henry Ford, the founder of the Ford Motor Company, stated, “Anyone who stops learning is old, whether at twenty or eighty. Anyone who keeps learning stays young. The greatest thing in life is to keep your mind young.” John Rooney, American sportscaster, and radio announcer for the St. Louis Cardinals, reportedly said, “The quickest way to become an old dog is to stop learning new tricks.” And Jackie Joyner Kersee, world class Olympic athlete in track and field, claimed, “I maintained my edge by always being a student; you will always have something new to learn.” These individuals all reflect the same sentiment: in order to grow, you have to learn; and in order to learn, you have to be teachable. The truth is, to be a successful leader you must be teachable. If you are not teachable, you will not learn and therefore you will not grow and become a more effective leader. On the surface, it is that simple. However, this is actually more challenging than it may appear, because often those who are not teachable do not recognize it, and even more often, our own pride, competitiveness, defensiveness, or self-centeredness leads us to resist acknowledging our need to learn. Therefore, becoming teachable requires a conscious and intentional effort, learning to exhibit specific attributes and incorporate specific behaviors that help us to learn. At it’s core, the skill of becoming teachable can be condensed to four necessary attributes and action steps, and these can be even more simplified to reflect the two more basic skills of looking and listening. Looking involves what you choose to see, listening involves what you choose to hear, and both are directly impacted by how you choose to interpret what you see and hear. Essentially, to be become teachable, you will need to follow the rule you learned as child about crossing a busy street (or the line from Elvis Presley’s Rubberneckin’) – you need to stop, look, and listen! First, stop and look, and there are two things that help you be more teachable by looking: study and humility. We study by reading, watching, asking questions, and learning from the wisdom and experience of others. It requires intentional study of the what’s, why’s, and how’s of life and the world around us. In doing so, we add to our base of knowledge, and gain a greater understanding of the practical application and use of that knowledge. Humility is our attitude, one that makes us willing to accept our own inadequacies, deficiencies, ignorance, and failures, so that we are then also willing to learn from those mistakes and willing to learn from others. I saw this in myself in an experience years ago. My family was having a get-together at my parents’ home, and while we were sitting around the dinner table, my dad made a comment about someday wanting to build a deck on the back of the house. One of my two brothers suggested that we do it the next day, because there likely would be very few times that we would all be together at the same time again. So, my dad sketched out the plans, and the next morning we went to the lumber store, picked up all the supplies, and then the four of us proceeded to spend the next eight hours building a large deck. What a great memory! When we were all finished, my dad commented on how he could see certain attributes of each of our personalities throughout the process. One of the observations that he made about me was that I was constantly asking questions, trying to understand why were doing things in a certain way, and learning from the experience. That observation was an accurate reflection; with an investigative nature, I have long known that you learn a lot by observing and asking questions. Second, stop and listen, and there are also two things that help you be more teachable by listening: reflection and feedback. Reflection is an internal skill and habit, in which we step back from our actions to think about them and analyze them, honestly assessing their effectiveness and appropriateness, so that we can learn, adjust, and improve ourselves. Feedback is the input that comes from other people and from the consequences of our actions. It may be unsolicited, coming in both positive (like the complement you receive when you share a good idea at work) and negative forms (such as the words or gestures that are “shared” with you when you accidentally cut another car off on the road), or it may be intentionally solicited or provided, in the form of guidance, mentoring, and assessment. Either way, it is something from which you should learn (even the harshest criticism can potentially create some truth to be learned). One particularly difficult experience helped me with this. My boss had called me into a meeting, and I knew that he had called for the meeting because he was unhappy with something I had done, and therefore this meeting would be a confrontation that I was not looking forward to enduring. As I shared my dread with my father, he challenged me to envision that God would be standing behind my boss, acting in much the same way as a ventriloquist, and to look past the angry words and tone and instead look for the message that God was trying to teach me. That’s not what I wanted to hear from my dad (I wanted him to affirm that my boss was all wrong and that I shouldn’t have to go through this), and his counsel did not make the meeting any more enjoyable, but it did change my response and allowed me to learn some things that I needed to learn in spite of the way in which the message was delivered. It was a hard lesson, but I learned some things that day about listening to feedback, both from my dad and from my boss. You see, “teachability” – or, the ability to be teachable – is essential to your growth as a leader. Humble yourself, study, practice self-reflection, and listen to feedback; all of these practices will help you to learn, but they must be willingly embraced. If you will do so, you will become a more effective – and respected – leader. “Be Trustworthy” is the third category we’re exploring in our “Be A Better Leader” series. In this series, we are looking at a variety of attributes, characteristics, and skills that are essential to effective leadership, and discussing how they are reflected in practice. In addition to this month’s topic, the list of categories also includes “Be Genuine,” “Be Relational,” Be Knowledgeable,” and “Be Excellent.” This month, as we look at what it means to “Be Trustworthy,” we will be talking about the need to be consistent, be safe, and be honest, and then I will share some thoughts on a recommended related book or two. 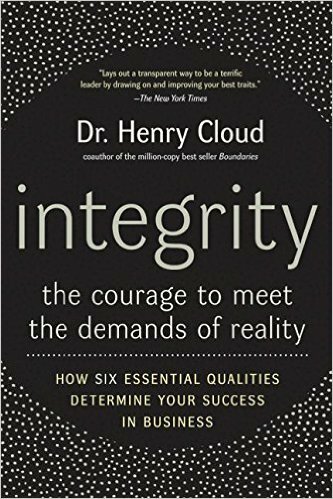 Very few people would question the importance of integrity and character and trustworthiness, and there are numerous good books available to prompt your thinking on these topics. Here are a couple of books that I’ve read in the last year or so that can provide some insight and food for thought. We have seen leaders on the national and international stage who clearly seem to lack character and integrity, and the impact of their leadership has been devastating to watch. However, it is sometimes our tendency to see that as a “far-off problem,” and miss the fact that character and integrity are important issues in our own leadership. This is the issue that Joseph Stowell addresses in Redefining Leadership: Character-driven habits of effective leaders (2014). Very early, in the introduction, he posits that, “The kind of person you are and how you navigate your leadership is at the core of long-term effectiveness” (p. 13). Essentially, he states that character-driven leadership is reflected in the kind of person you are as you lead, and how you lead, and he establishes Jesus as the teacher and model of this kind of leadership. Character-driven leadership, he says, reflects Jesus and gives us credibility. 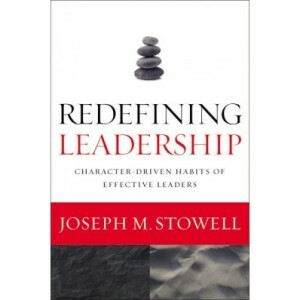 In the first section of the book, Stowell differentiates between outcome-driven leadership and character-driven leadership, and then explores the implications of those differences, including the impact that results from the “who” and “how” of our leadership. In the second section of the book, he establishes Jesus as the example to follow. He explores and explains Jesus’ actions and thought process (the mind of Christ), and draws from them lessons for our own leadership that reflect Jesus’ style of leading (and serving). In the final section of the book, Stowell explains and applies the principles given by Jesus that are found in The Beatitudes, in the Sermon on the Mount, and establishes these as core competencies for character-driven leadership. There is no doubt in my mind that character-driven leadership is an absolute necessity for our leadership as followers of Jesus, and this book is an excellent resource for helping us to understand and apply it. The challenge is that the pressures of the world in which we lead often make it difficult to maintain character and integrity, which in turn makes it that much more important for us, becoming a way that we can set ourselves apart and reflect Jesus to the world around us. I would urge you to reflect on your own leadership style and practice, and make sure that the actions you are taking, the motives that are driving you, and the character you are exhibiting all reflect Jesus, and I would encourage you to pick up a copy of this book as a reminder and a resource. 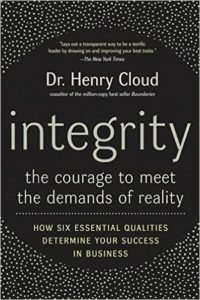 According to Dr. Henry Cloud, there are three essential qualities of successful leadership: Competence, or the ability to “master your craft,” to “get good at what you do”; Relationships, or the ability to “cultivate and maintain relationships that are mutually beneficial”; and Character, or “your makeup as a person . . . not just moral safeguards, but who you are at your core, in both positive and difficult circumstances.” It is this third quality, Character, that he addresses in his book, “Integrity: The courage to meet the demands of reality” (2006). I found this to be an interesting and thought-provoking book. The emphasis was not so much on the character trait of integrity, but rather on the importance of having an integrated character. I would probably describe it in terms of consistency in your response to the realities of life in all circumstances, which reflects who you are as a person. Therefore, in this context, integrity is actually referring to an internal state – the unified wholeness in your character and your personhood as you navigate life. I do believe whole-heartedly that consistency and authenticity are necessary for successful leadership (and successful relationships), so this is a good lesson on which to reflect. Therefore the lesson is that integrity is crucial for effective leadership. And it must be something that is demonstrated over time in all circumstances. It cannot be a characteristic that you demonstrate in some circumstances, but not in others, picking and choosing when you think it will benefit you to act honest like a jacket that you put on or take off to fit the mood or the environment. People will very quickly identify that as disingenuous and dishonest. Rather it must be part of who you are all the time. For integrity to be believed, it must be genuine. When I was young, I once heard integrity defined as the characteristic of choosing to do what is right even when no one is looking. That idea must be true of your actions in all circumstances; whether it is public or not, whether it is easy or not, whether it personally benefits you or not, you need demonstrate integrity. Do it in the big things, but also do it in the little things, in your daily choices of what you do, or what you say, or what you allow. If people know that you have integrity, they will trust you enough to follow you. So regardless of what type of leader you are, what your circumstances are, or what the environment is in which you lead, integrity must be a genuine and integral part of who you are, how you live your life, and how you lead. To be an effective leader, you must lead with integrity, because when your life reflects integrity, people will be willing and able to trust you. Have you ever seen someone’s spirit get crushed? I have. I can remember sitting in a fast food restaurant when I was in my early 20’s, when a young boy at a nearby table spilled his soft drink. His mother immediately reacted by loudly and harshly belittling him with her words, and by publicly humiliating him. He was visibly crushed. If he learned anything from that experience, it most likely was that accidents are unforgivable and should never happen. He learned that, in his world, it was not safe to make a mistake. When people believe that it is not safe to make a mistake or to fail, they will stop putting themselves at risk. They will stop trusting people, taking chances, putting in effort, and growing. Instead of taking a risk, or learning something new, or stepping up to the plate, they will revert to a place of self-preservation. They do this to protect themselves from the consequences that could come with failure, by removing the risk of failure altogether. We need to remember that failure plays an important role in the development of leadership. In fact, it plays an important role in the development of all people. For that reason, leaders need to have the right perspective regarding failure, so that they can intentionally harness its power for good, and a right perspective on failure includes three important ideas. Failure is valuable. Thomas Edison famously said, “I have not failed. I’ve just found 10,000 ways that won’t work.” Clearly, he viewed every mistake, every setback, as a learning opportunity. That’s what makes failure valuable. It provides an opportunity to learn, to change, and to grow. By implication, if you don’t learn from your failures, you won’t change and grow; rather, you will continue to make the same mistakes. This differentiation is one of the attributes that characterizes leaders – they are able to learn from their mistakes and improve. However, the underlying context that makes this work is an environment that allows someone the opportunity to learn from mistakes. It only makes sense, then, that if it is not safe to make mistakes and learn from them, people will avoid behaviors that bring the possibility of failure, and therefore will miss the opportunity for growth that comes from those same failures. First, provide opportunities for people to try. Experience is such an important part of growth and development, but experience only comes when someone has the opportunity to try – to lead a project, manage a task, facilitate a discussion, plan an event, and so on. What we have to keep in mind is that (like a baby learning to walk) people will stumble in the process of learning something new and stretching themselves. Therefore, the second step is to have a response that is instructive, not destructive. Use it as a teachable experience, one from which they can learn. Take time to evaluate the causes and contributing factors, the mistakes that were made, and provide guidance that will ultimate produce greater growth, confidence, and development. Finally, the third step is to give people a chance to get back up after they have fallen, to “get back in the saddle” and try again. The goal is that they have learned from their failures and become more competent and skilled, which will be better for everyone. And if they don’t learn, then you have; you now know that they are beyond their limits of performance, at least at this point in their personal development, and therefore you, the leader, can choose to not give them those opportunities again. President Theodore Roosevelt once declared, “Far better is it to dare mighty things, to win glorious triumphs, even though checkered by failure, than to take rank with those poor spirits who neither enjoy much or suffer much, because they live in the gray twilight that knows not victory nor defeat.” Failure is an important part of life. Make it safe for people to fail and then to learn. When you make it safe for them to do so, they will learn to trust you, and will therefore be freed up to try more and do more, which will benefit both of you in the end. “Your walk talks and your talk talks, but your walk talks louder than your talk talks.” I heard my father say this many times when I was growing up, in his effort to teach the importance of being genuine. The lesson reinforced to me on numerous occasions was that my words – what I say – and my actions – what I do – need to match. In fact, the reality is that people will judge me more by my actions than by my words. I want to go one layer deeper in this principle. The consistency of doing what you say will do is critical to effective leadership, but it will really only work well if it is genuine, and it is only genuine if it is who you are. In other words, it’s not simply about your actions matching your words, but your life matching your values. Jim Collins calls this “consistency of action – consistency with values, consistency with long-term goals, consistency with performance standards, consistency of method, consistency over time.” (Collins & Hansen, 2011, p. 21) Consistency begins with what you say, is demonstrated by what you do, but is validated in who you are. It is actually at this deeper level that you will find the strength and courage to resist the pressure to compromise in ways that make you inconsistent, especially when circumstances are difficult. “Be Relational” is the second category we’re exploring in our “Be A Better Leader” series. In this series, we are looking at a variety of attributes, characteristics, and skills that are essential to effective leadership, and discussing how they are reflected in practice. In addition to this month’s topic, the list of categories also includes “Be Genuine,” “Be Trustworthy,” Be Knowledgeable,” and “Be Excellent.” This month, as we look at what it means to “Be Relational,” we will be talking about the need to be a talker, be a listener, be relational, be a teacher. When we think about teaching, our minds generally go immediately to the role of a classroom teacher in a school. We tend to think of it as an occupation, rather than a way to communicate, as a job that someone does as opposed to how you interact with others in a way that helps them to learn something. However, while teachers play an invaluable role in the development of children, we are mistaken if we think that it is a job that is only relegated to someone in a classroom. The reality is that if you lead people you are a teacher. I personally have experience in the professional role of educator, having served as a junior high and high school teacher for a number of years, and having spent more than two decades in a school environment as both teacher and administrator. I had subject matter that I was responsible to teach, and my job was to help students learn necessary and relevant information, and to develop critical thinking skills. But it also was a vehicle through which I sought to shape the minds and the lives of my students in the context of a relationship. Leaders are also seeking to shape the minds and lives of those they lead, and so effective leadership can and should learn some things from the theory and practice of professional educators. Therefore there is great value in understanding what teaching looks like and how it has an effect on people. Gaining an understanding of this can help us with a framework for how we also can teach others. If we want to become better teachers (and we all should), then we need to look at the learning process and at teachers. In the book Blended (2015), authors Michael B. Horn and Heather Staker discuss the concept of disruptive innovation and its application to the world of education, especially as it applies to online instruction and blended learning. They make the point that today’s schools were originally designed to standardize teaching and testing (the opposite of differentiation and customization), but in today’s global, information-based culture, the new need is for student-centered learning, which is personalized (tailored to an individual student’s particular need) and competency-based (they must demonstrate mastery before moving on). As they researched students in the learning environment, they then sought to identify the primary motivators for student learning, and found two motivating desires: 1) to feel successful and make progress, and 2) to have fun with friends, engaging in positive, rewarding social experiences with others. In short, they learned that students – the learners – want to successfully achieve, experience good social relationships, and receive individualized instruction whereby they can show what they know in the way they do best. So research gives us some insight into what learners in general want to experience, but what about your own experience? Like most people, you can probably think of teachers who made an impact on your life, so we should be asking ourselves what they did that makes them stand out to us. When you do that, you will probably find several core practices or behaviors that characterized those impactful teachers: 1) they cared; and specifically, they cared about you, and you knew it, 2) they were examples that you felt you could emulate, because they were models of how to live life effectively and with meaning, 3) they challenged and inspired you, pushing you to do more than you thought you were capable of doing, and 4) they gave you feedback, both positive and negative, to support, encourage, and grow you, but also to hold you accountable and correct you. Now put these ideas together, those from research and those from your own personal experience, and it will begin to give you a picture of what it means to be a teacher. If you apply this to the people you lead, it will help you to see that they want to progress and achieve, they want to have positive and caring relationships, they want to do what they do well in the way they can do it best, they want someone to show them the way and challenge them to grow, and they want to know how they are doing. And you don’t have to be in a classroom to do all of these things. First, teach with your heart, developing a genuine care for people. Build relationship by taking a personal interest in their lives and showing that you care about them. Second, teach with your words. Take the time to explain why and how, helping people to understand what it is that they are doing and how it connects to the other people and tasks around them in the organization. Third, teach with your life, by living in way that is consistent with what you say, demonstrating integrity, and keeping your promises. Be an example they can emulate. Show them what you expect by demonstrating and modeling. Finally, teach with your responses. Empower them to act, and then give them support and encouragement, but also give them constructive feedback to help them learn and improve. In essence, to be an effective teacher, you must care, tell, show, and respond. These are all behaviors that can and should characterize you as an effective leader. Perhaps you have already been doing this and didn’t realize that in doing so, you have been a teacher. Perhaps you need to begin to do them. Regardless, remember that good teachers help students to achieve, even beyond what they believed was possible, and so it makes sense that if you can be a leader who teaches, the people you lead will grow and you will benefit. And the most effective teachers know that the best teaching happens in the context of relationship. So be relational, and be a teacher.